A great class for beginners, as well as for those who already got the basics, and have a craving for some more fun silks moves. Those who are just beginning their aerial adventure will be introduced to it slowly and securely. Those who like to be challenged and feel that they need a good workout will also find what they're looking for here! An inspiring, fun and creativity-enhancing way to improve your general strength, flexibility and aerial vocabulary. This class is quite unique among other trapeze classes available around. It is focused on transitions between movements, building routines, and developing creativity. You will be given a chance to think about alternative ways of going from one position to another, improve your general understanding of the equipment and experiment in synchronizing your sequences with the music! ​Classes will cover more complex moves and aerial choreography, increasing understanding of the art and focusing on good form. You must be accomplished at beginner moves and have a good awareness in the air to attend. This class is currently not running! It is also a perfect way to build upper body and core strength, and focus in particular on your posture and shoulder alignment. All this with great fun! Aerial Yoga draws from the alignment and techniques of yoga, using a low hanging, wide Aerial Sling to aid in moving through traditional yoga postures. By supporting your body weight on the Aerial Sling, it helps to access these postures and deep stretches in a more relaxed way. One of the primary features of using a Yoga Hammock is its ability to decompress the spine and mitigate joint stress as you practice stretches and positions with the support of the sling. The ‘weightless’ aspect of these classes assist in allowing you to access a wider range of movement by moving through poses that would otherwise be restricted. Flipping, climbing and sliding with elements of aerial, dance and free running. Chinese pole are vertical shafts of aluminum covered by neoprene which is used by circus performers and fitness enthusiasts for climbing, sliding down and holding the poses. These poles are generally between 3 and 9 meters in height. The Chinese pole in Aerial Art House/Aerial room is 5.5 meters height, with crash mats around the pole provided. This class will cover a range of skills on Aerial Rope/Corde Lisse, including conditioning exercises, static positions, dynamic movement and creation. Exercises will be adapted to suit a variety of abilities. 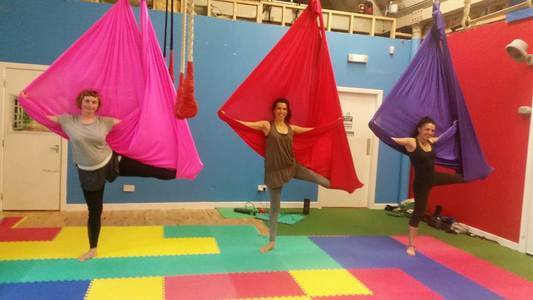 Please contact us if you are intrested in Aerial Rope and Aerial Straps classes. Those classes will start in January but we are taking bookings now!!!! This class will cover some basic and more advanced techniques on straps. Exercises will be adapted to suit a variety of abilities. We will explore a range of conditioning exercises that build strength and technique for the basis of straps practise and will also enhance your strength and body awareness for application in other aerial disciplines. ​We will also cover some of the key straps positions and movement between these, dynamics and other creative ways to move on the straps.